As a teenager, my dream was to become a really good golfer. In my school holidays I played three rounds every day and practised inbetween. Ouch - talk about bleeding hands! I studied architecture in London, but having won several major British amateur events and having played very well in The Walker Cup, I decided to turn Pro. The travelling was extensive from Australia to South Africa, America, New Zealand and Europe, but it was most rewarding and I won 5 professional events and had 21 'top 3' finishes. Travelling also provided a great further education and I met some amazing people. 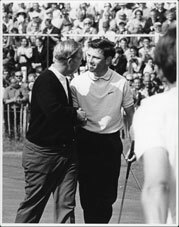 I had the great pleasure and experience of playing with Jack Nicklaus in the last round of the Open at Hoylake. I finished 3rd behind Nicklaus and de Vicenzo. Apart from finishing 3rd in The British Open, my biggest thrill was playing in The Ryder Cup.....However, if America had not had Nicklaus, Palmer, Trevino, Weiskopf, Casper and Chi Chi in their team, they would never have beaten us! A gem of English golf, Sunningdale Golf Club. For nearly 20 years I was initially the playing Pro and latterly the Head Professional at Sunningdale Golf Club in Berkshire, England. 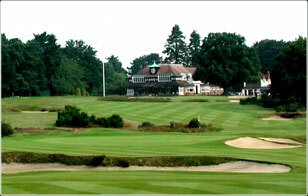 Sunningdale has two excellent courses, some great members and is one of the premier clubs in Britain. Announcing at the Players Championship on #17 at the TPC. 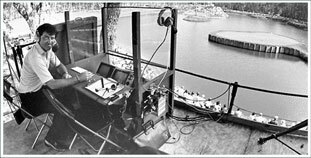 By the time I was in my early thirties I had also been offered a place on BBC's golf commentary team and had the chance to sit next to two of the most articulate and humorous sports commentators in the game - Henry Longhurst and Peter Alliss. They were magic days and ones I remember with great fondness. 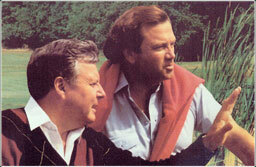 Alliss Clark, a new design team was formed. Less than $100,000 a hole?? Peter and I became good friends and, having worked together on TV for a number of years, we decided to venture into golf course design, a business Peter had previously worked in. Designing in Britain was a very different scene to the States. For a start, golf course budgets were much smaller. This was because there was seldom the real estate involved and a decent construction budget for 18 holes was usually under $2m. I consider this training a huge asset. It taught me to look after my clients' money and learn the tricks of the trade on how to make each dollar really count. It was a marvellous experience and they were great days. Through years of experience, Clive Clark Design has the ability to balance economic priorities with high quality golf... You are very welcome to call us.